Garmin Travel Kit (5" Widescreens) (010-11685-01) | Discount GPS Accessories from mysatnav.ie Ireland's leading GPS & Sat Nav store. We recommend the travel kits because they are great value. 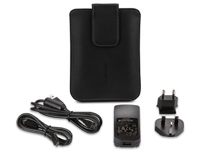 You get a decent carry case with a magnetic clasp that is suitable for all Garmin nuvi 5" sat-navs, a mini and micro USB cable, a wall charger that has adaptors for Ireland & UK, Europe and the US. One of the main benefits of the a/c charger is to keep the battery in your sat-nav in good condition. The vehicle power cable that comes with your sat-nav may not necessarily charge the battery in your device, and even if it does, the quality of the charge may be poor. The most common fault we encounter with sat-navs is battery deterioration. Our experience is that, while it won't stop battery deterioation, an a/c charger does slow the process down and if you device is regularly connected to the wall charger the battery's life is longer.